Here’s good news for those in Oakland’s Grand Lake neighborhood who lamented The Kwik-Way’s sudden (and rather dramatic) departure: There’s a new burger joint on the block. Open for about three weeks in the former Kung Pao Kitchen location, JJ Burger (3415 Grand Ave.) specializes in char-broiled, six-ounce Angus beef burgers. It’s the first restaurant for owner Joseph Huang, who spent the past four years working as a line cook in big hotels. He said the menu at JJ Burger is similar to what you’d find at an old-fashioned diner: burgers, onion rings, milk shakes, and the like. According to Huang, the burgers are a step up from your typical fast-food burger in that they feature brioche buns, fresh produce, and custom toppings. They’re also slightly more expensive — $8.50 for the average burger, or $10.50 for a combo that comes with a drink and skinny fries. The other point of distinction is the number of options for non-beef eaters: chicken burgers, turkey burgers, fish burgers, and veggie burgers. 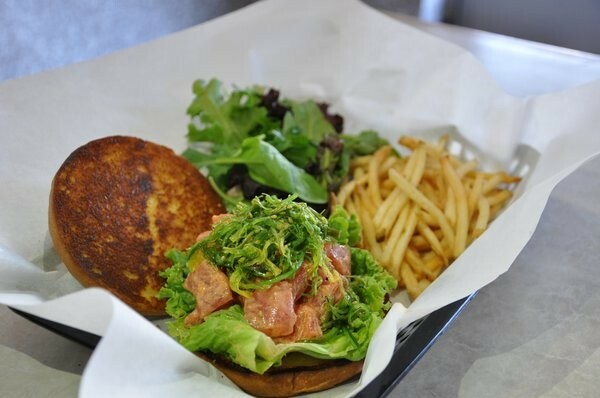 There’s also a Hawaiian-style ahi poke burger: cubes of raw, marinated yellowfin tuna and a seaweed salad on a burger bun, with wasabi sauce on the side. As an opening promotion, the restaurant has been giving away a scoop of green tea ice cream with the purchase of any combo meal. It has been such a popular feature that Huang said he plans to extend it indefinitely — except now customers can pick whatever ice cream flavor they want. 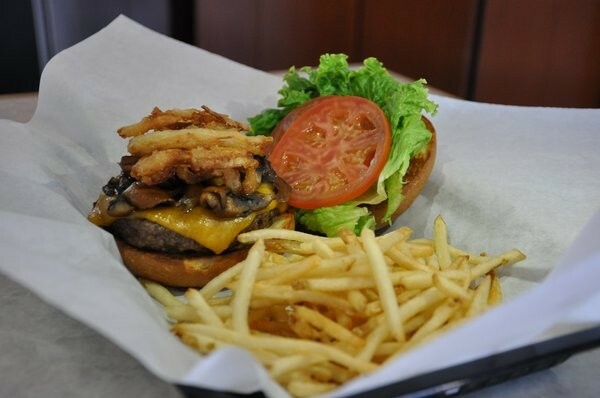 JJ Burger is open Tuesday through Sunday, 11 a.m.-9 p.m. The restaurant doesn’t have a website or Facebook page at this time.